Baby, it’s cold outside! It’s been a chilly couple of weeks by Southern California standards. Whenever the weather gets like this, I start thinking about stews, roasts, gratins and slow cooked meals… warm, cozy dishes that take the edge off the frost. This stew is a concoction I came up with last week, and I must say it is deeeeelish. I used skin-on, bone in dark meat chicken thighs for extra flavor. I sauteed the thighs in olive oil for a few minutes, which produced a little schmaltz at the bottom of the pan. 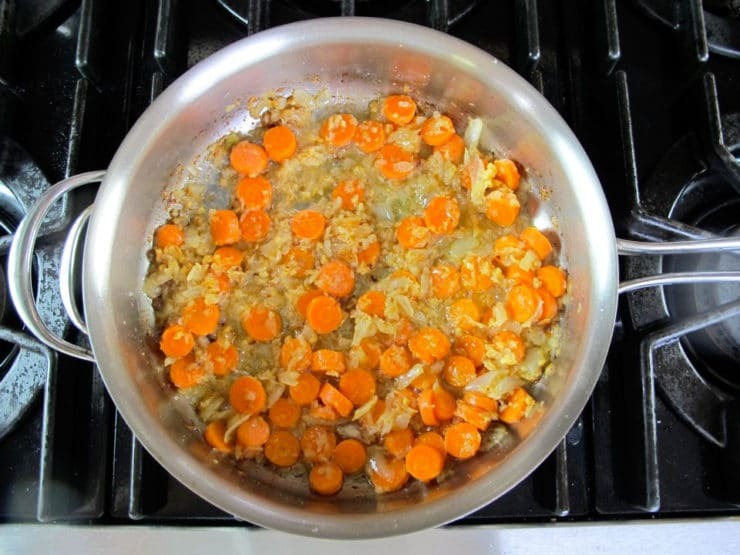 Instead of draining the fat, I used it to saute the onion, carrots and garlic to give the stew some extra savory flavor. When I added the chicken back to the stew, I left it on the bone with skin. As the stew simmered, it was infused with even more chicken flavor. I added smoked paprika to give it a slightly smoky vibe. You can use regular paprika as a sub, if you’re having trouble finding the smoked variety. The roasted bell pepper adds a touch of sweetness to the mix. At the end of cooking I deboned the chicken and shredded it, then added it back to the stew. A final simmer reduced the sauce, thickening the stew and enhancing the flavor of the spices. The result? 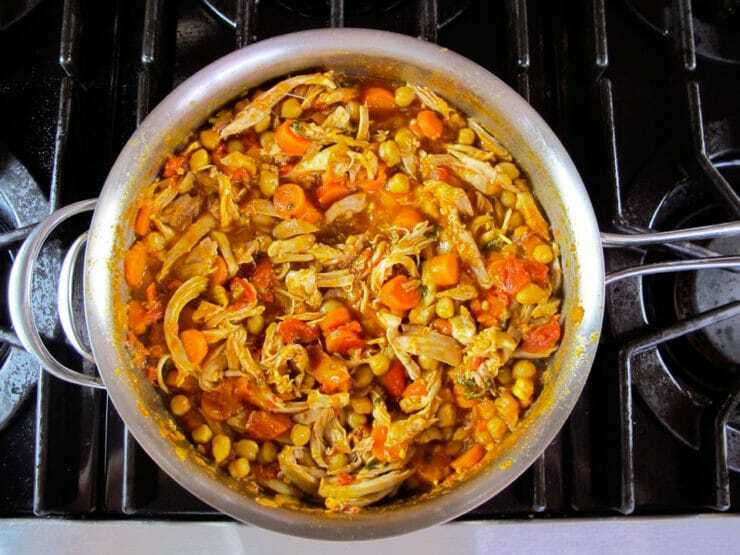 Chicken Chickpea Stew! 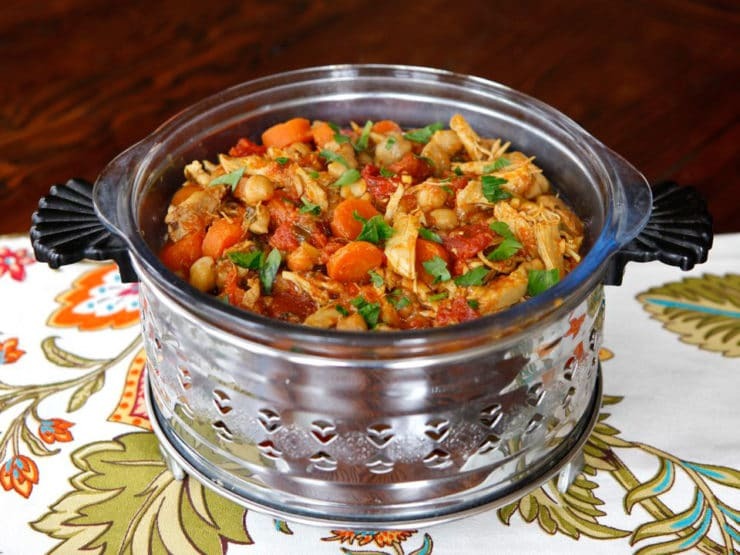 It’s kind of similar to a savory chicken tagine, with a unique mouth-watering spice combo that I really enjoyed. The secret is the schmaltz… that little bit of chicken fat produced when you first saute the chicken produces a ton of flavor. 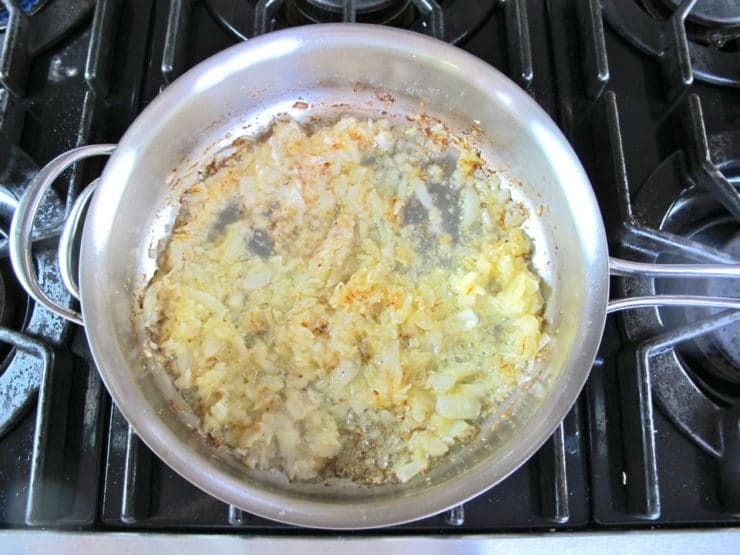 Some people don’t use schmaltz and will be tempted to drain it off to lower the fat content of the dish. Please don’t fear the schmaltz! It’s not so bad for you. In fact, some might argue it’s actually good for you. A few of my readers have mentioned that they’re actually trying to incorporate MORE schmaltz into their diet for health reasons! How do you feel about schmaltz? This easy, healthy one pot meal will definitely become a part of our regular dinner rotation. Serve it over cooked quinoa, couscous or brown rice for a hearty winter meal. To learn how to roast a bell pepper, click here. 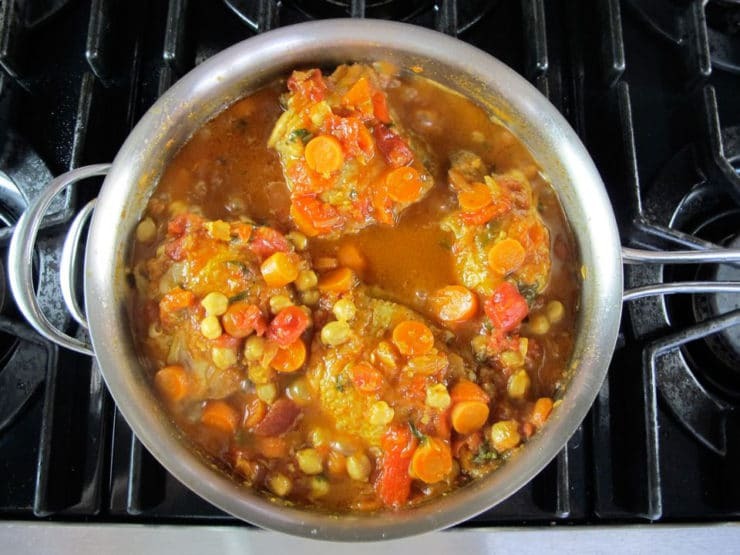 Chicken Chickpea Stew, a healthy, savory stew recipe with dark meat chicken, schmaltz, garbanzo beans, tomatoes, carrots, spices. 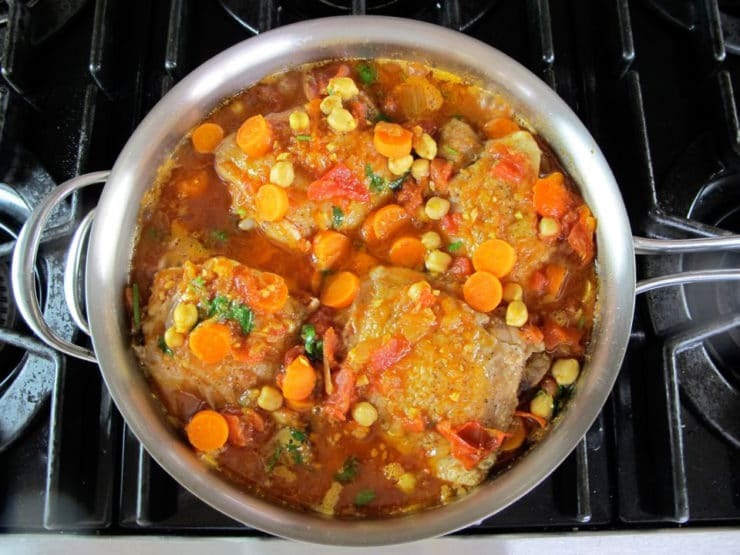 Kosher, Tagine. Sprinkle chicken thighs lightly with salt and pepper. Heat olive oil in a sauté pan with high walls over medium heat till hot. 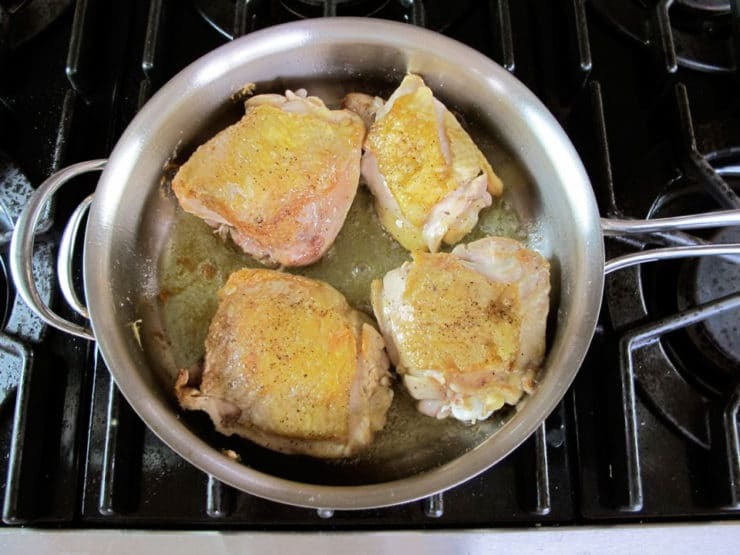 Place the chicken thighs into the hot oil, skin side down, and turn heat to medium high. Brown the thighs for about 10 minutes, flipping once halfway through, till thighs are browned on both sides and skin is golden and crisp. Remove the thighs from pan. Do not drain the fat or juices from the pan. Add the minced onion to the pan and cook for 5-8 minutes till softened. Add the carrots and cook them for 5 more minutes till the onion starts to caramelize. Add the garlic and cook for 2 minutes more till fragrant, stirring and scraping up the brown bits from the bottom of the pan as the mixture cooks. Add the chicken broth, diced tomatoes, chickpeas, roasted bell pepper, smoked paprika, cumin, turmeric, cayenne, and 3 tbsp of the chopped cilantro or parsley. Careful with the cayenne when adding to taste, it’s extremely spicy. I liked to add ¼ tsp of cayenne, which gives the stew a nice spicy kick. Stir the mixture and bring to a boil. Add salt and pepper to taste (I usually add about ½ tsp of salt or less depending on how salty my chicken broth is). Reduce heat to a simmer. Put chicken thighs back in the sauté pan and ladle sauce over them. Cover the pot, vented on one side, and let the stew simmer for 45 minutes, stirring occasionally. Uncover the pot. Continue to simmer for 15 more minutes till the liquid reduces and the sauce starts to thicken. 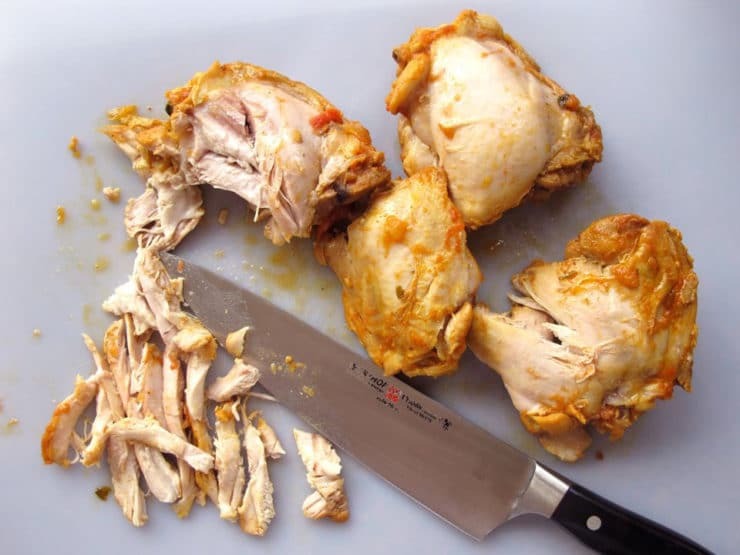 Remove cooked chicken thighs from the sauce. Remove the skin and discard. Cut meat from the bones in small shreds. Discard bones and any excess fat. Return the chicken shreds to the sauté pan and stir to combine. Simmer till heated through, or until the sauce is thickened to desired consistency. If the stew seems too dry, add a little chicken broth to rehydrate. Remove from heat and sprinkle with remaining 2 tbsp chopped cilantro. 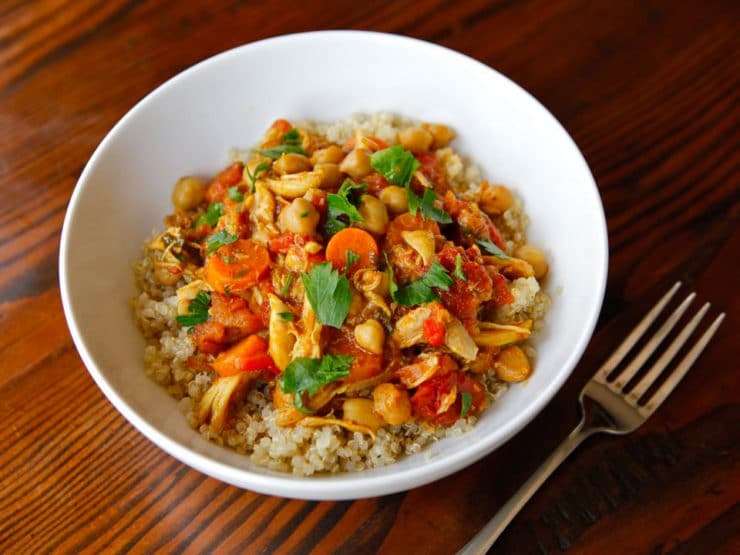 Serve Chicken Chickpea Stew over cooked quinoa, couscous or brown rice. I made this dish exactly as instructed. It was DELICIOUS. It will be added to the power rotation. This recipe was a hit with my whole family, including 5 and 10 yr old kids. I left out the cayenne and roasted red peppers to adapt to my kids’ palettes, and substituted a cup of tomato sauce for the diced tomatoes (since my kids like the taste of tomatoes but not the chunks of tomatoes). I thinned the stew with some more chicken stock and served over brown rice. I will be adding this to my rotation, thanks for sharing the recipe! Made it on Sunday for an early dinner. Served it over red quinoa which matched perfectly. I loved it a lot, even though it took some time to prepare (soaking the chickpeas the night before, roasting, seeding and skinning the pepper bells), but it is absolutely worth it. Unfornately, my common law husband doesn’t like neither cumin nor smoked paprika that much, so I used way to little of both of it. Still, it was very good – had I used more of these spices, it should have turned out awesome! Thanks, Tori for sharing. I made this on a Sunday afternoon. Amazing recipe, fragrant and complex but very easy with your step by step instructions. I might add other root vegetables like parsnips next time. There will be a next time for this stew ! I’ve made this recipe a couple of times now, and my family loves it. I found it goes great with a greek yoghurt dipping sauce, which I added a little bit of garlic to. Helps combat the spicy kick. This recipe looks perfect for this Shabbat. I think this may become part of my repertoire! Thanks for all your great recipes. I love reading them in addition to making so many. I tried this recipe yesterday and it came out great. I had all the ingredients on hand when I came across this recipe. I used skin on, bone in chicken breast but otherwise followed the recipe exactly. The result was perfectly juicy meat in a sauce with compex flavor that my toddler and my husband loved. The chickpeas and carrots were perfect for the little toothless one (my toddler, not my husband). Thank you for this recipe, its a keeper! So happy to read this Zhanna. I have a few friends with toddlers who really enjoy this dish too, I am starting to think it is “toddler friendly” and a great way to introduce them to some new spices/flavors! This looks delicious, I’m going to make it for my forthcoming ski trip. Only one question – do you use hot or sweet smoked paprika? Ben, in my part of the world smoke paprika only comes in one heat level– mild (sweet). So use that if you have the option. I’m not much of a cook, and because I don’t have an oven I’m always on the lookout for dishes I can cook on the stove top or in the microwave instead. Still, I tried this recipe, substituting chicken breasts for thighs, paprika for smoked paprika, and a pinch of pili pili for cayenne. I also used bulghar wheat instead of quinoa, couscous, or brown rice. What a result! It was absolutely delicious and definitely a recipe to keep. I’m looking forward to more from you, thanks. I like to add rice when bringing everything to a boil. Amazing! Cooked one for my boss now.. I’m curious what they’ll say.. But for me = I LOVE IT!!! Is there such a thing as too many compliments? Made this tonight in my dutch oven and loved it. Thank you Tori. So glad you got a chance to try it Marry, it’s one of my favorites! This dish was awesome! Full of such flavor. The smoked paprika definitely makes this recipe! Thanks for sharing!! This looks so perfect! I love everything about it. I made this earlier this week, and wow! I was venturing outside my box a bit, having never cooked with smoked paprika or turmeric before or even roasted a pepper (I know), and I’m so glad I did. I wanted to toss out one serving suggestion–I served ours over shredded cauliflower “rice”, and it was the perfect complement. So glad a friend linked me here–I will definitely be back for more. Just kidding! I see now that it is the chickpeas peeking out. I want to make this tomorrow night! Will chicken breasts be a mistake? That’s what I have in the fridge right now. Also, the picture makes it look like there is corn in this, but it’s not listed as an ingredient. Did you add corn? Are they bone in, skin on? If yes, then go for it as written– it won’t be as tasty as dark meat, but it will work. If they’re boneless skinless, you will lose the flavor of the schmaltz and the bones, which adds so much to the dish. That said, you can use boneless skinless, with the following modifications– don’t saute them first, or they’ll get overcooked. Instead, use olive oil to saute the onion and veggies. Assemble the stew, simmer, then add the boneless skinless breasts to the stew/sauce about 20 minutes before the end of cooking. Cover them with sauce and simmer till they’re cooked through and the stew is reduce and thickened, then shred the meat. It really makes me happy knowing that my recipes are being made and enjoyed all over the world. Thank you so much for writing Gloria! Not only does the recipe sound good, but your cooking instructions along with your fine photos has turned me into a follower. I will be trying some of your Passover recipes! I am making this for dinner now and the house smells awesome! So great to hear, Alice! 🙂 Let me know how you like it. I hope more people try this recipe, it’s so healthy and satisfying… and really very easy! I cooked this dish this weekend and really like the way it came out. I did not have the smoked paprika so I used regular paprika and added an extra 1/2 a tsp of Chipotle pepper for the smoky feel. Came out great. It is very similar in taste and feel to a north African dish recipe that I make that uses cinnamon along with the cumin. Chipotle is a great substitution, Roshan. Glad you liked it! I made this for a huge shabbat dinner of friends and family of over 30 people and it was a huge hit! I can’t wait to make it again. It’s an awesome dish to make over the weekend and eat through out the week. I love love loved it! This recipe tasted so good!!!! So happy you liked it Laureen! Both would be great additions, Larraine… just make sure you use less salt to taste, since olives are quite salty. Enjoy! It turned out great! Thank you for the idea! I will most definitely be making it again! Tried this yesterday! It was delicious!! Yay! Thanks for reporting back Lucinda. I have officially added it to our regular meal rotation. Love it when a dish is easy, healthy and delish. This is so my type of dish! I love it. I do not care for thighs…. What do you suggest? Looks great cannot wait to make it! Hi Victoria, in that case I would use 6 chicken legs… or, if you don’t like dark meat, 2-3 breasts. I prefer the dark meat because it cooks up more moist. Just take care if you use legs, there are more bones to deal with. Enjoy! 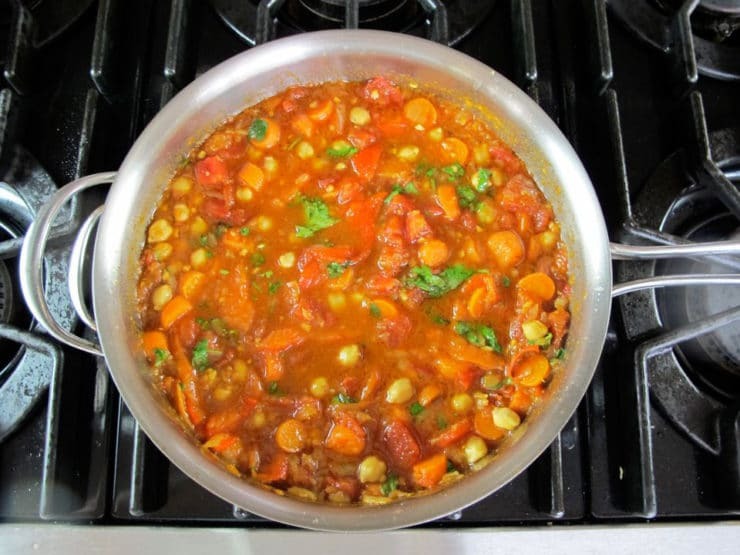 I love the warm spices in this stew, and that you use roasted bell pepper for extra sweetness. Reminds me of a similar Spanish dish with potatoes.The secret is keeping bones and skin on. Love your idea of browning skin so it is crisp yum! yum! Do you have a cook book with your fantastic recipes? Hi Mike! How sweet of you to ask. A cookbook is currently in the works. Stay tuned!